The Trinity Centre is a fantastic independent venue where a variety of concerts and events are held and you can even attend weekly dance classes. Fees varies, contact venue for further details. Groups, Contact venue for further details, proof may be required. A challenge 25 policy is in force at the bar area. What did you think of Trinity Centre? The dance classes here make me so happy! Possibly the most unique late-night venue in Bristol, there’s more to The Trinity than meets the eye. 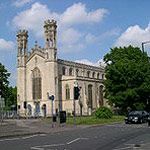 Just a ten minute walk from the local shopping centre, opposite the Trinity Road police station on Stapleton Road, Easton, The Trinity Centre has been the home of Trinity Community Arts since 2004. 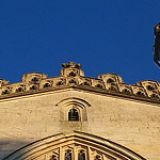 Based in a converted two-hundred year old church, it provides an unusual setting for late night live musical escapades. The concept of clubbing in a church is quirkily appealing, but there are a few draw-backs. The open plan nature of the building means that there isn’t much in the way of alternative areas in which to chill-out and gather your composure away from the madness of the main event. The really generous sized dance floor makes a welcome change to the pokey dance venues that proliferate down town – even when there’s a big crowd in, you’ll find there’s enough room to really get down to the sounds. The fluro-backdrops, moving wall projections and exposed cables that snake their way along the underside of the beamed ceiling conjure up a nostalgic air of DIY nu-rave. As is often the way since the smoking ban, if you want to go out for a smoke you’ll find yourself imprisoned in a chicken-wire pen with all the other addicts – not the most memorable point of a night out. Once you get past the tough looking and thorough security on the door, the main vibe of Trinity is completely non-pretentious, diverse and community orientated. During the day, training and educational sessions ensure that it feels like something more than simply a club. The bar staff are friendly under fire and the cloak-room attendants are helpful and trustworthy. Attracting an eclectic crowd of different ages from all over town, it feels like safe place to let your hair down. The live gigs and dance nights are as varied as the crowd that comes here. One weekend it will be all fluro face paints, stilts and psychedelic trance or a Roni Size drum and bass reunion, the next it will be the Icelandic sensation Emiliana Torrini on tour or some cult Glasweigan band. There’s always some new and unpredictable event round the corner, which keeps the appeal of The Trinity broad and fresh. The sound system is good, especially the bass which pleasantly reverberates about your being. There’s now a greater selection of drinks than previously available: from pear ciders to West Country ales, all tastes are catered for, and most drinks cost around the £3.50 mark so by club standards it doesn’t break the bank. However, on a busy night, the single bar isn’t quite enough for the demands of hundreds of thirsty-party goers – there is something to be said for patience and determination when trying to get served when the bar’s twenty-people deep, end to end. But this can become jarring. Also, a little more seating in the bar-area wouldn’t go amiss. The Trinity is definitely what going out in Bristol is all about: friendly, a little bit alternative, with lots of people from different backgrounds getting together and having a good time. What it lacks in seating and chill-out areas it makes up for with originality of character. Definitely up there on the list of mad nights out to have in Bristol.